Portpatrick - the ideal base for a short break by the sea. Ah, 2016 – it’ll long be remembered as the year Scotland had a summer that lasted until early June. Unheard of since the long, hazy summers of the 1970s. Mr G is working this weekend, and The Wee White Dug and I are at home mourning the passing of summer. So, I thought I’d share a recent trip with you. This one’s from April, when we enjoyed a short break in the pretty harbour town of Portpatrick in Dumfries & Galloway. It was a last-minute, spur of the moment trip – our trips often are. We played one of our favourite games – ‘beat the weather forecast and gloat’. It involves finding a tiny speck on the map of Scotland with a good weather forecast. Then, as most of the country is battered by high winds, rain and snow, we sit back and wait for the barrage of woeful Facebook updates from our friends and family. “It’s so cold, wet, snowy, miserable, winge, winge, winge.” That’s when we deliver our sucker punch. Photos of us having a fabulous time in the sunshine. We struck gold on this trip and gloated with comments like “Is it raining in Edinburgh? Gosh, it’s lovely here” and “SNOW in March??? – that’s crazy. It’s sunglasses weather where we are”. En-route to Portpatrick we decided stop at Culzean Castle in Ayrshire to explore the castle’s vast, dog friendly grounds. A wee tip to get you talking like a local – the castle is pronounced Kullain as in pain and not Culzeen. In the care of the National Trust for Scotland, Culzean Castle is without a doubt one of Scotland’s most striking buildings. It was a favourite of President Eisenhower, who stayed there whenever he visited Scotland. He was given a lifelong tenancy of an apartment in the castle by the 5th Marquis of Ailsa – a thank you for his war efforts. Movie buffs amongst you may recognise the castle as the home of the fruitcake, Lord Summerisle from the 1973 British horror movie Wicker Man. Thankfully, there was no display of naked bonfire jumping during our visit, and if Lord Summerisle was home he didn’t make himself known to us. After a wander around the grounds and much pleading with The Wee White Dug to pose for a photo, we decided to stay for lunch. We ate at the castle tearoom which is located in a sheltered courtyard. It was definitely an al fresco dining sort of day. Al fresco dining in Scotland often involves much flapping and grabbing of napkins as they’re whipped off the table in high wind. This wasn’t one of those days. This was a calm, flap free al fresco dining day – bliss. After lunch we headed towards Portpatrick. The drive between Culzean Castle and Portpatrick is lovely. It snakes its way along scenic coastline, before cutting inland through rich, green farmland. Portpatrick is a pretty harbour town, clustered around a craggy bay. We stayed at Dunskey Guest House, which sits on a fabulous elevated spot, overlooking the town. Our host greeted us warmly on arrival, and showed us to our rooms. The teen had decided to grace us with her presence on this trip, and as the room prices were so reasonable she got one all to herself. Not having to squeeze into a family room like The Broons at the But n Ben would make it a more enjoyable stay for all. The town was deserted as we wandered down towards the harbour for dinner. We’d been recommended a couple of dog friendly places to eat and decided to try The Crown Hotel. Once inside we soon realised why the town was so quiet – everyone was at The Crown Hotel. It was packed to the rafters with dugs and humans. Casper settled under our table and gazed adoringly at a pair of Springer Spaniels who’d caught his eye. I was expecting standard pub fare but I was wrong, the food was excellent. We really enjoyed our meals, including the fussy teen who rarely finishes a dish. It was high-end pub grub, and there was an extensive selection of seafood on the menu too. Good seafood is never hard to find in Scottish harbour towns. After a sound sleep, we were up and out early the next morning. We had plenty of time for a spot of exploring with the boy before breakfast. The Teen slumbered on, as she’s incapable of functioning on anything less than 20 hours of sleep a night. Her loss, as it was a beautiful morning with a bright blue sky. I’d seen a walk on the Walk Highlands website that led to the ruins of Dunskey Castle, so after pottering around the town and harbour we set off to do some castle exploring. It was a lovely, short walk. We didn’t meet another soul either, which was an added bonus. Dunskey Castle is a spectacular medieval ruin that sits perched on the edge of a cliff. The views out to sea from the castle are fantastic. We stood soaking up the scene and enjoying the tranquility, before heading back to our accommodation for breakfast. The Teen had stirred from her slumber by the time we arrived back at Dunskey Guest House, so we enjoyed a tasty cooked breakfast together before checking out. Our visit to Portpatrick had been short, but fun. Anyway, Mr G’s home from work now, and the sun has reappeared, so were off out with the boy to enjoy it while it lasts. Such a cute dog and beautiful pictures! Fascinating, wonderful blog – so very glad I found you! Thank you – lovely to have you join us on our travels. It is always such a pleasure to read your posts, this time I had three that were new to me. I loved each one of them as always, but this one is my favourite, Culzean Castle is just amazing I really hope to see it one day. We had 35 degrees yesterday, Italia’s waiting for you. Love the castles and the Wee White Dug! A lovely post as always, how do you get the little feller to pose so well he’s a natural. Fantastic photos & dialog! Thanks for sharing. For us, here in the Scottish Highland, 2016 will be the year that winter stayed around until June 20…and counting! Lovely photos – enjoy your whisky tasting! If I had a dog I’d travel the world with it! Thank you – such a beautiful part of Scotland. Thank you so much for sharing beautiful pictures and wonderful Scottish tales. 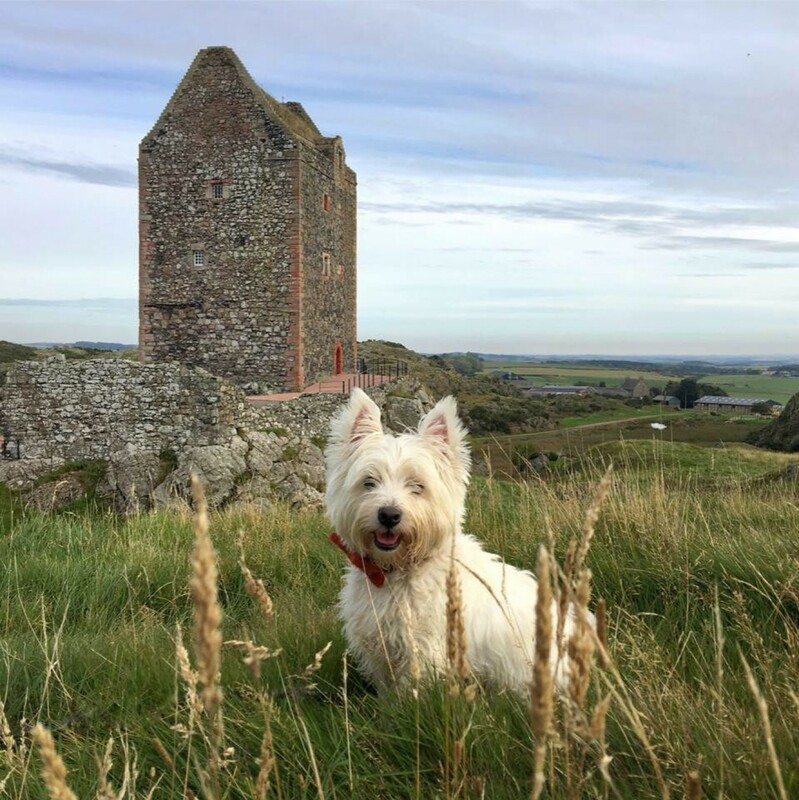 I couldnt be more thrilled to see your wee white dug posing in front of these breathtaking castles and landscapes. Thank you so much. We really appreciate you joining us on our travels.